Quite an intriguing title isn't it? :). I noticed this book with R and I had to get it. I finally bought the book last evening and I couldn't wait to read it... Ah..how long has it been since I read a good book? When I read the preface, I smiled all the way through and felt like calling every other person who has accused me of over-analyzing situations and ridiculing the concept of discussing abstract ideas. And just today I came across a blog where the irate author rants about Internet Poetry, and the uselessness of silly fools who write, appreciate and try to decipher them. I was amused :). I hear plenty of such statements, "Of what use is it to talk of such useless stuff? ", "There are no answers to this, it's so silly", "What a waste of time", "I am a lesser soul, not an intellectual"... and many more comments. And I tell all of them the same answer - I am no intellectual myself. I strongly believe that these puzzles jog your mind and stimulate your thinking. They help us crack open our minds... a teeny tiny bit at least, to consider problems and situations in different perspectives, and to sharpen our ability to reason. It makes us realize how mundane our day-day grievances are and how solutions are simple, if only we opened our minds :). And here's what Julian Baggini says, "Imagination without reason is mere fancy, but reason without imagination is sterile. The purpose of such "thought experiments" is to strip away the things that complicate matters in real life in order to focus clearly on the essence of a problem.... like scientific experiments, they aim to isolate key variables, the specific factors under examination, to see what differences they, and they alone, make to our understanding of the world.... the experiment is a tool to aid our thinking, it does not pretend to describe actual life... sometimes they make us see problems which don't seem like problems until you follow through their implications... Many lines of thought can be started from this book. But none ends in it." Beautiful!! It feels good when someone expresses my views in such a coherent and delightfully beautiful manner. 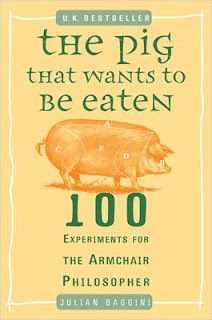 Baggini presents 100 philosophical questions inspired from a myriad sources; Descartes to Plato to Hume to Spielberg. He presents his own view of the problem, ending with a statement to provoke the reader's thoughts. So I have taken it upon myself to write my own views on each of the 100 puzzles discussed in the book, and I would love to further the discussion.